Your Financial Action Plan outlines twelve simple steps that will improve your level of financial literacy as well as help you forge the financial future you desire. Today, financial knowledge means financial power, and in Your Financial Action Plan, you'll be introduced to the important personal financial issues that affect your life. Filled with practical guidance and extensive expertise, Your Financial Action Plan will help you build the type of financial life you've always wanted. G. COTTER CUNNINGHAM is an authority on personal finance. For over a decade, he has given consumers expert advice on their important finan-cial matters. Mr. Cunningham is the Chief Operating Officer of Bankrate, Inc., which operates Bankrate.com, the most-visited personal finance rate information Web site in the world. Mr. Cunningham and his colleagues provide consumers with comparative data and practical advice on CDs, mortgages, auto loans, banking, taxes, and financial planning. Bankrate.com helps consumers to select the best financial institution for their particular needs. Bankrate provides financial data and information to a network of more than 75 partners, including Yahoo!, America Online, the Wall Street Journal, and the New York Times. Cotter Cunningham has a unique background and perspective on personal finance. He has spent almost his entire career in finance, from working as a loan officer and running an Internet-based credit card program, to advising companies on financial strategy. Cotter believes the first step in financial independence is to foster a basic understanding of the who, what, why, where, and when of financial matters. 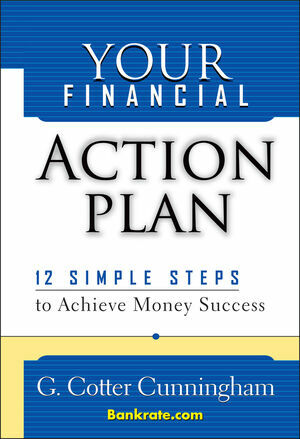 In Your Financial Action Plan, he provides readers with the knowledge they need to plan their financial future. He lives in Palm Beach Gardens, Florida, with his wife and children. Life Insurance: How Much Do You Need?